The trouble was that in my family we did not willingly eat mushrooms. It was decades later and leagues away from the swamps outside Mobile—after I left home for good—that I learned of the pleasures of button, Shitake and honey mushrooms, of mushroom and Alfredo cream sauce, of sautéed mushrooms and onions, of salads with sliced, fresh mushrooms and almonds, of meaty portabellas, morels and golden chanterelles. Such exotic delights had to wait for sophistication. But when I was a child of the 50s, mushrooms were treacherous plants—as everyone knew. People died eating them. We were convinced of the facts because we encountered ‘shrooms all the time in the woods. Circles of the white and elegant Death Angel grew in mysterious, deadly fairy rings in forest glens. Overnight, after a rain, brown-encrusted buttons pushed up from the black humus, summoned by unknown malevolent powers. Dire warnings were not lost on us about eating wild fungi and the fate that befell indiscriminant mycophagists. We were well acquainted with mushrooms, but without really knowing them. We encountered them everywhere but maintained only a nodding acquaintance. Mushrooms, toadstools, bracket mold, and mildew, all were denizens of the dark and decaying places of the earth. No place was safe. Even in our bathroom in the humid corner under the toilet tank, there grew up what my mother—a proper Southern lady—called a Devil’s Finger: red, sticky and rank. But in my roguish imagination Lucifer’s fungal appendage seemed something more phallic—and alarming—than an interloping digit. Thus there was no escaping the incursion of mushrooms into our lives. And mushrooms and toadstools were indistinguishable to children. So we maintained an uneasy truce, keeping our distance, we and the fungi. Perhaps, if we gave them a wide enough berth, they would not harm us. In retrospect, I, Sammy Gene Matteson—as the eldest, at the cheeky age of nine—must have been the provocateur who incited the riot, the one who reminded his sister Cindy Lou, his junior by twenty months and their brother “Baby” Dale, soon to turn six, of the admonitions regarding eating wild mushrooms. “What if they made a mistake at the soup cannery?” I began. “Yeah! . . . What if they put in a toadstool by mistake?” Cindy added. I thought of the headlines: “MOTHER OF THREE POISONS KIDS! MUSHROOM SOUP IMPLICATED!” We began to bawl. We began to howl. After more tears and more negotiation, we children finally agreed to drink the creamy soup, but we resolutely refused to eat the “poisonous” mushroom pieces that floated in it. I finished my soup first. I looked down to glimpse an ironic half-formed fairy ring of uneaten mushroom bits smirk back at me from my bowl. I hear my beleaguered Mother’s voice once again, and it breaks my heart. For from this distance I understand, at last. She set more on the table than food: she ladled love-seasoned desperation into our empty bowls. She offered up everything she had, meager and unwelcome though it was to us. We did not mean to be cruel. I only hope that she forgave our anti-fungal insurrection. Surely she did. But whether she did or she did not, she never tried to feed us mushroom soup again. The usual suspects. The Matteson kids ca. 1953, a few years before the soup riot. 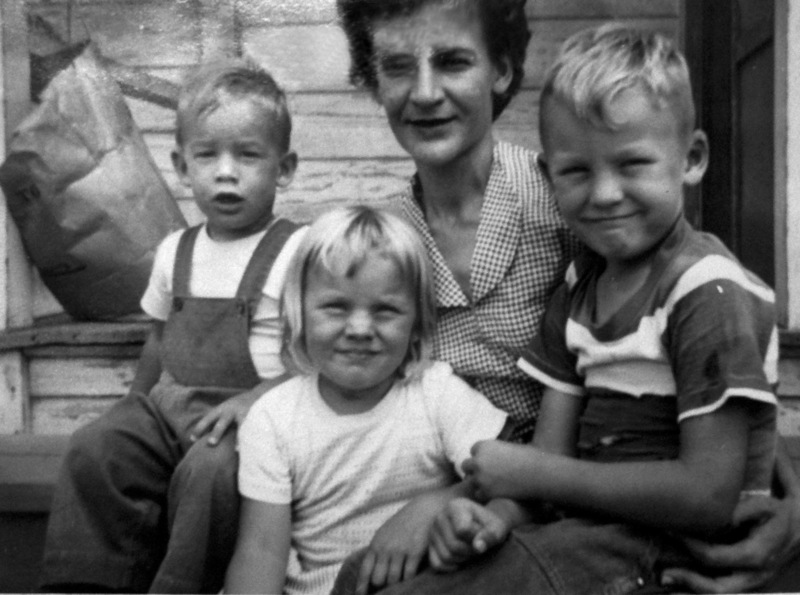 (L to R) “Baby” Dale, Cindy Lou, Mother Audrey, and Sammy Gene. As those who follow this blog will notice, this vignette was read for the Listen to Your Mother casting. We were disappointed to learn that it did not fit with the directors’ vision for this year’s production. More the better for my readers, since the tale is too true and too “rich” to sit on the shelf.